Here at Devonquest Reg'd Doberman Pinschers, we aim to improve upon each litter, with carefully chosen, health tested and titled parents, to produce ever better puppies. Our priority is to produce sound pups, with good temperaments who come from lines with demonstrated longevity. Puppies are raised in our house, living with us and our children. They are socialized to many objects and situations and are temperament tested at 7 weeks. Learn more about the dogs that have shaped us along the way. 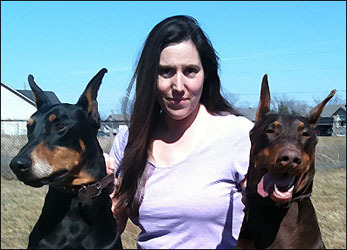 Devonquest Reg'd Doberman Pinschers is a member in good standing of the Doberman Pinscher Club of Canada and the Canadian Kennel Club. What is the difference between an ethical breeder and a backyard breeder? We do not endorse or support the breeding of "white" or albino dobermans. To read more facts about albino dobermans, please visit the Doberman Pinscher Club of Canada .